Today we are excited to make the Google Friend Connect API available to developers. Google Friend Connect lets a site owner instantly awaken and strengthen the community that visits their web site. Make it easy for every site owner to add Friend Connect to their site, regardless of their technical capabilities. We do this by letting site owners simply paste snippets of code into their websites' HTML to instantly provide social capabilities on their sites. Be open by letting visitors control their own data and freely share it with sites and services as they see fit. Services that are currently integrated with Friend Connect include OpenID providers like Yahoo!, social network providers like Twitter, and update aggregators like Plaxo Pulse. Use REST APIs to integrate your existing login systems, registered users, and your existing data with new social data and activities. These APIs are also part of the OpenSocial standard. In addition, we have used the APIs to build open source plugin samples that integrate into popular commenting and content systems including WordPress, Drupal, and phpBB. This release is documented in code.google.com. 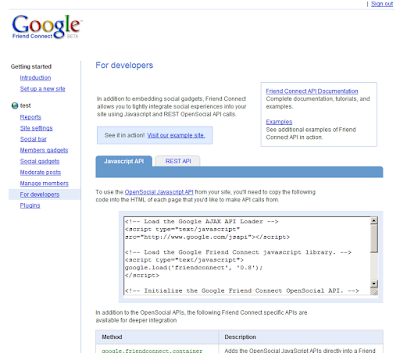 To take advantage of the the API on your site, go to www.google.com/friendconnect and visit the "for developers" section to grab the snippet that enables the new API on your site. We're looking forward to hearing your feedback, and to seeing how the development community will combine their creativity, Google Friend Connect, and these APIs to enrich the open social web. Make sure to check out Google I/O on May 27 - 28 where you can meet the engineering team and learn more about the Google Friend Connect API. I m very excited to see Google Friend connect API !! I have installed GFC on my blogs and have close to 200 members but still I am clueless on how to use Google Friend Connect meaningfully. sites redirection for spanish, of this post, are not working. What I HATE is that they send you an invite that says "JOHN DOE wants you to join such and such" and John Doe doesn't necessarily want me to join. He didn't way to himself, Hmm, Greg will really enjoy this. I think I'll send him a link." All John Doe did was absent-mindedly click some button and the web service goes rip-roaring through JD's address book and sends everybody an invite on behalf of John Doe. Google, you guys have integrity. PLEASE DO NOT STOOP TO THIS LEVEL OF DECEPTIVE BEHAVIOR!!! "I'm following A Stonemason's Journal and think you'll be interested in it as well. To check it out, follow the link below: ... "
Please google, don't do this! Thanks for everything awesome that you do! Can Friend Connect be used to require membership/login to "Members Only" sections of a site? I'll be putting out a solicitation for a freelance opensocial developer to do it, but first wanted to find out if it's even possible.